ROCKY MOUNTAIN NATIONAL PARK — It’s mid-winter. We’re at 11,000 feet, and Arctic-like winds that sound like a squadron of F-14s are roaring off the Continental Divide. In a few hours, the feeble rays of the sun will disappear behind the crags of Hallet Peak, and the stingingly cold air will slap us with a frigid below-zero wallop. We’ve snow-shoed into the backcountry with 50-pound packs crammed with winter survival gear. Except for tents. And since the two of us are getting ready to spend the night clinging to the side of a mountain surrounded by nothing but rock, ice and snow, I figure that makes us the coldest fools in Colorado. This assertion is being put to the test. In spite of what would seem to be a dire predicament, my partner, Ed Huesers, assures me that we will survive our winter camping ordeal. Better yet, he says, we’ll do it in style, staying warm and dry no matter what Old Man Winter throws at us. 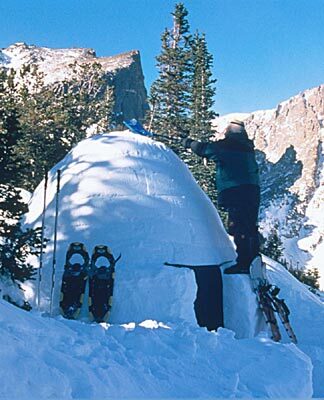 Our salvation is Huesers’ own creation, called the Ice Box snow shelter tool, a pack-able igloo-making device. If all goes according to plans and promises, in several hours we will be comfortably hunkered down in an igloo, protected from the elements by a spiraling stack of rectangular 8-inch-thick snow blocks we’ll make with the Ice Box tool. “Igloos are warm and quiet,” he says, unpacking the meager-looking 4.5 pound contraption that looks like a plastic three-ring binder with an attachable telescopic aluminum pole. “You can stay dry inside an igloo because the air is warmer than freezing, usually about 34 to 40 degrees, depending on the number of people inside and whether they’re using stoves and lanterns.” This is news to me. Like most winter campers, I’ve always relied on a sturdy four-season tent. Set it up, crawl in, and hope that your sleeping bag’s below-zero rating is up to snuff. Huesers, a mold maker and owner of his own company, Inventors Aid Service in Longmont, reminds me of the pitfalls of tents and winter camping. “Tents can shred during big windstorms. And they usually don’t get much warmer than about 10 degrees above the ambient temperature,” he says. Until I met Huesers, the idea of building an igloo in Colorado seemed as remote as the North American tribes who built the ice shelters on pack ice above the Arctic Circle, as I learned during my igloo research. “Igloos are temporary structures that were made by a number of tribes living in the Arctic fringes of North America,” says Joyce Herold, an anthropologist at the Denver Museum of Nature and Science. Two groups are generally associated with igloos: the Inupiat of Alaska and the Inuit of northern Canada, she says. But instead of forming blocks as we were about to, the native groups used whale-bone saws and knives to excavate blocks from existing snow pack. 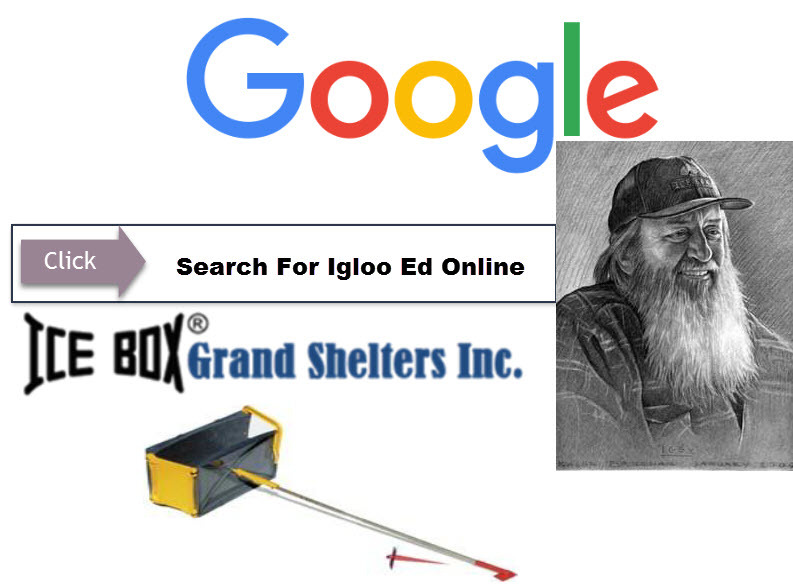 With these tidbits of knowledge tucked away in my skeptical brain, we start our own igloo project. Back in Rocky Mountain National Park, as we survey our building site, we find that there’s plenty of material for our igloo. The structures usually take two people about three hours to complete. But in this corner of Rocky Mountain National Park, the sugar snow is absolutely dry and stubbornly refuses to clump together. With such weak material, I’m worried that our igloo might turn out to be a flimsy house of cards. But these are minor details to Huesers, who says that the Ice Box will work with any kind of snow, and that we’ll just have to devote a little more elbow grease to get the job done. We start by leveling and stomping down a platform for our 8-foot diameter igloo. After getting a solid foundation, the Ice Box is put into service. The unit has an adjustable aluminum pole with a center spike that’s driven into the base. This fixture point guides the block building as the tool pivots around, laying course upon course like a bricklayer. As the walls grow and curve inward and upward toward the ceiling, the pole adjusts shorter and serves as a stand to build and set the final blocks. Huesers stands outside the perimeter, harvesting the choicest snow (“not to chunky”) with a shovel, then carefully tossing the load into the slightly curved form. It’s my job to gently pack down the snow. When I’m too vigorous, Huesers gets wide-eyed and gives me his mantra about technique. “If you pack it too hard, you’ll fracture the block,” he says. After a while, I’m getting the hang of it. Shovel, pack, shovel and pack again, gently remove the tool and begin the adjoining block. We repeat the procedure roughly 65 times — the number of blocks it takes to cap-off our wintry domicile. By now it’s dark, and thanks to the sugar snow, the effort has taken roughly twice as long as normal. But I’m amazed at how snow that refuses to be clumped into a snowball has somehow miraculously stayed put and turned rock hard. To prove the point, Huesers gives a few rough kicks to the igloo. Not a dent. “I don’t advise it, but these igloos get so strong that two big guys can stand on top of them,” he says. Our work is still not done, since no igloo is home until it has a door and sleeping platforms. With the temperatures dipping below zero, Huesers goes into overdrive, shoveling madly but precisely to create an entrance below the igloo’s floor. From there, he tunnels upward, and like a sculptor, carves a walkway and two sleeping platforms before the final touch of poking an air vent in the dome’s apex. We settle in, and with the glow of two clean burning iso-butane stoves and lanterns, the interior is bathed in a golden light. After an hour, the temperature is about 40 degrees warmer than the outside — toasty enough that we shed our parkas, sit atop our sleeping pads and cook up our meals. I’m not convinced that igloos are the answer to every winter camper’s dream of a secure shelter. I still like my tents. Yet I’m impressed at how comfortable, sturdy and livable our igloo is. Huesers, on the other hand, is obviously in his element and plans to take his igloo tool to the ultimate testing grounds. In two years, he hopes to team with accomplished climber Gary Neptune of Neptune Mountaineering in Boulder, and try to climb Mount McKinley (Denali) in Alaska using igloos as their sole means of shelter.